This question came up again, for Becky, quite a few years ago when she collaborated with Louise Williams from Olympia, Washington on a series of folding books about the whimsy and wonder of children and their imaginations. Now Jane and Becky are creating two horses to ride in Jane’s “Inner Cowgirl” rodeo. 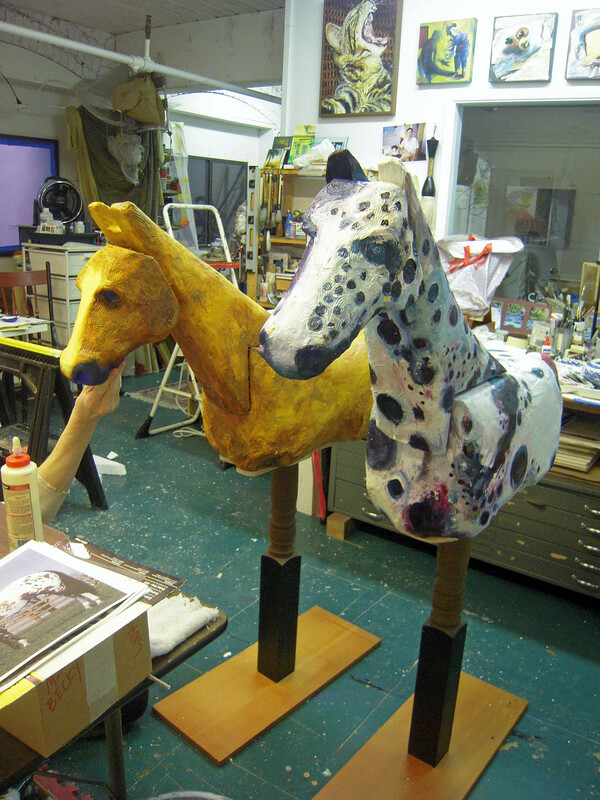 The horses were carved from styrofoam in Becky’s studio in July, 2011. Subsequently, Jane has gone back to her studio in Phoenix to contemplate her “Inner Cowgirl” some more while Becky engineers and embellishes the horses for their premiere in March, 2012. STay TuneD to watch their DeveloPment–and JaNe’s CoWGirL too! I’m getting excited for the SHOW!!! thanks Cheri! the show will be at Gallery 110 in Seattle during the month of March, 2012. A postcard will go out about it too.